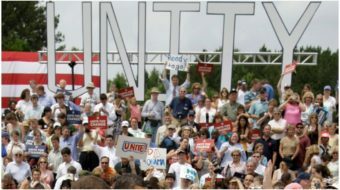 The 2012 election season has begun looking brighter for Democrats. Days after their candidate won an upset victory in a special congressional election in a heavily Republican district in western New York, CNN released the results of a new poll it carried out, showing President Obama’s approval ratings on the rise. According to the poll, 54 percent of Americans approve of Obama’s overall job performance, while 45 percent disapprove. In April, Obama’s approval rating was 48 percent. The current number is Obama’s highest since he scored the same result in Dec. 2009. But while overall numbers look good, the poll results still show reasons for Democrats to worry. Out of 11 specific issues, Obama scored more than 50 percent approval in only three areas, and those were all foreign policy issues. By large majorities, Americans approve of Obama’s handling of Iraq, Afghanistan and, especially, terrorism, in which he won 65 percent support. This, the CNN pollsters say, is due to the killing of Osama bin Laden, especially for senior citizens and independents. In January, Obama scored 60 percent for his handling of terrorism, and other polls have shown a bump since bin Laden’s execution by Navy SEALs. Obama scored points on Afghanistan as he has promised to end that war. 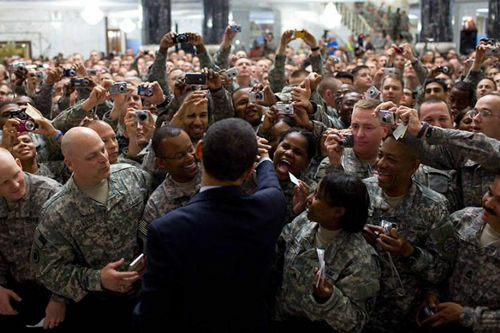 A separate poll, done by Gallup earlier this month, showed that 59 percent of the American people now oppose the war in Afghanistan, and 80 percent said they approve of Obama’s plan to begin removing troops in July. On the situation in Libya and the conflict between Israel and Palestine, the public is about evenly split, almost within the three-point margin of error. Obama recently returned from a trip around Europe, in which he made high profile visits to Ireland and the United Kingdom, as well as stops in Poland and elsewhere. In general, Americans seem to be happy with Obama’s presidency overall and his administration’s foreign policy – but not its handling of domestic issues. Perhaps not surprisingly, given the extremely high cost of gas, only one in four Americans, exactly 25 percent, approve of his handling of gas prices. Still, the president falls short on virtually all other issues, including taxes, the economy, the deficit and his signature issue, health care. Polling is not a zero-sum game, however. A lack of support for Obama’s policies in one area does not automatically translate to support for the Republican alternative. For example, while Obama received only 44 percent support on his handling of Medicare, Americans have widely rejected the GOP’s proposals. The same is the case with health care. The 57 percent who disapprove of Obama’s policies in this area include people who agree with the Republicans, but also those who think health care reform did not go far enough. More troubling for Democrats is a widespread unhappiness with Obama’s handling of the deficit. While many economists, the labor movement and sections of the Obama administration believe that the only way to solve America’s economic troubles is to increase public investments into infrastructure and other areas, there seems to be no political appetite for it, unless it comes with spending reductions elsewhere. Without that public stimulus spending, though, the national jobs crisis is likely to worsen, causing more unhappiness with the economy. A poor economy nearly always translates into lower presidential approval ratings. If the economy does not improve, Obama’s increased approval ratings might be short-lived. Still, the high overall approval rating of President Obama, combined with a widespread unhappiness with GOP policies, does seem to give the Democrats a better chance going into 2012 than they had in 2010. 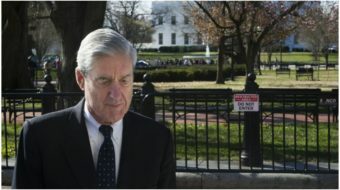 The poll, in which 1,007 Americans were interviewed by telephone, has a three-point margin of error and was conducted May 24-26.